Cooked in the traditional long slow simmering way of dulce de leche or cajeta, this rich caramel is made with camel’s milk, said to be a healthy alternative to cow’s milk and better tolerated by folks with allergies. Here's one fact: It is deliciously creamy. I have been known to do a little happy dance when the farmer’s market in Houston still has some goat’s milk left because usually all of their bottles are spoken for, by regular customers. But sometimes I get lucky. And one of my favorite things about living in Singapore was the goat farm where I could go and buy the milk directly from the, ahem, producers. Homemade soft cheese made with goat’s milk is the best. When we moved to Dubai a couple of years ago, I discovered that one could buy camel’s milk in the grocery store, which intrigued me but somehow I never got around to buying any. Then, a couple of weeks ago, at the first birthday celebration of Food e Mag dxb, an online magazine to which I’ve been a contributor (It’s gorgeous! Do go have a look!) I met a Dubai-based cookbook author who has a weekly show on local talk radio. I regularly listen to Suzanne Husseini on 103.8 FM Thursday mornings from 10 a.m. – noon, because her topic is one of my favorites, food! Since the party was on a Wednesday evening, nosy parker that I am, I had to ask what the focus would be for the next day’s show. And because she’s a sweet person, Suzanne didn’t tell me to buzz off. She said it would be camel milk. That's Suzanne in the hat, and me, on the right, with our Food e Mag dxb's editors Debbie Rogers and Ishita B Saha.. I learned so much from that show! Do you know that the farmer cannot separate the camels from their calves, as we do to cows, or they’ll stop producing milk? Also, the top producers only make between 5 and 20 liters a day vs. 40 liters from top producing cows. Camels are not mature enough to be mated until they are four years old and they carry their babies for more than 13 months before giving birth. Compare that to cows that can mate at 13-15 months old and have a gestation of nine and a half months. Or goats that can be bred at seven months old and that give birth after only five months! So, why would a farmer choose to raise camels for milk? It will come as no surprise to learn that camels are uniquely suited to the dry environment here and, while they don’t produce as much milk, they also don’t need as much water as other dairy animals would. 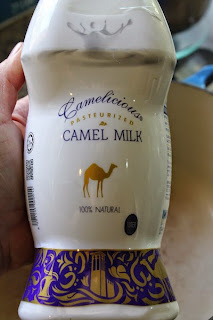 Camel milk doesn’t coagulate as easily as goat or cow milk so I decided that cheese would not be my first foray into using it. 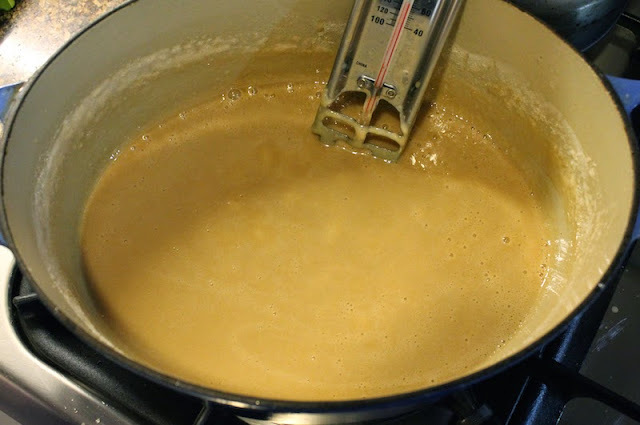 Instead, I decided to try making cajeta – that sticky sweet caramelized condensed milk usually made with goat’s milk. 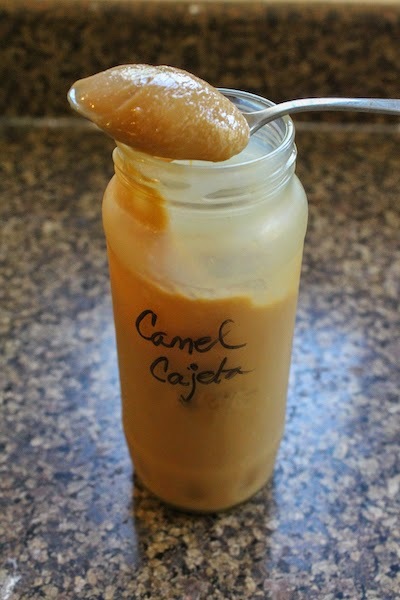 Or if bought in a can as dulce de leche, cow’s milk. Make this on a slow day when you are going to be home for a few hours anyway because it has to cook long and low. Mine took almost three hours. Adapted from this recipe on Pati’s Mexican Table. 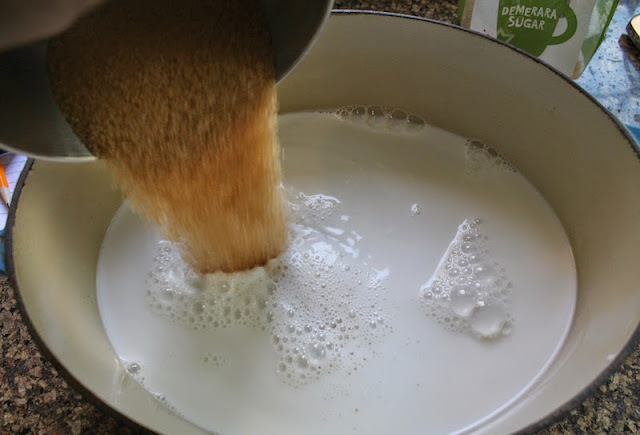 Pour your sugar, vanilla and baking soda into a large thick-bottomed pot with the milk and heat gently over a medium flame, stirring until all the sugar is dissolved. Let it come to a slow boil and then turn it right down, or add a diffuser under the pot. 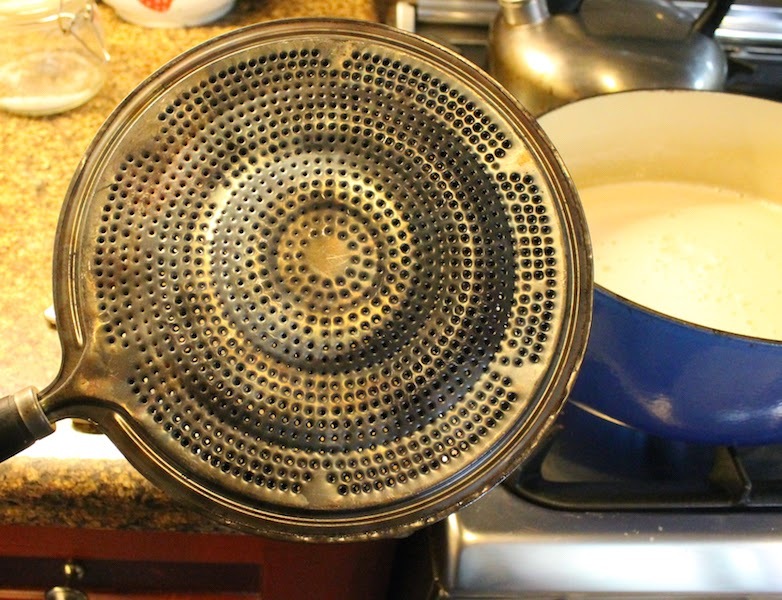 I had other things going on at home that day and I was afraid the milk might scorch so I used the diffuser. These are great for making sure the rice at the bottom of the pot doesn't burn either. If you are a thermometer-using type, I kept one in the pot and the temperature stayed between 165-180°F or 74-82°C. Cook slowly, stirring occasionally, until the milk reduces by at least half and starts to turn a warm golden color. Keep a closer eye on it now and stir more often. 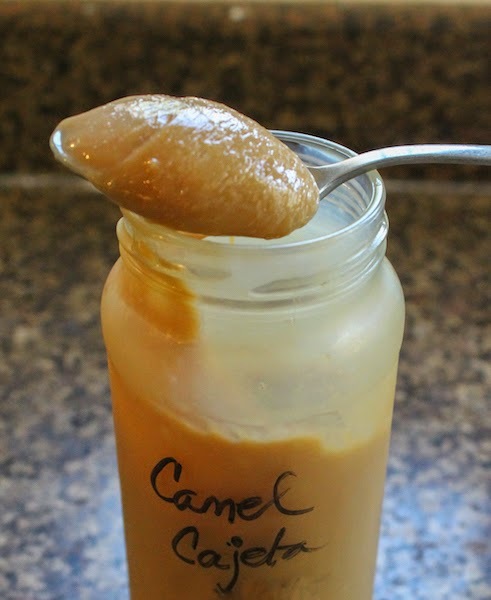 The camel milk caramel is done when a spoon pulled through the liquid shows the bottom of the pot for a few brief moments before running together again. It should be a deep golden color. 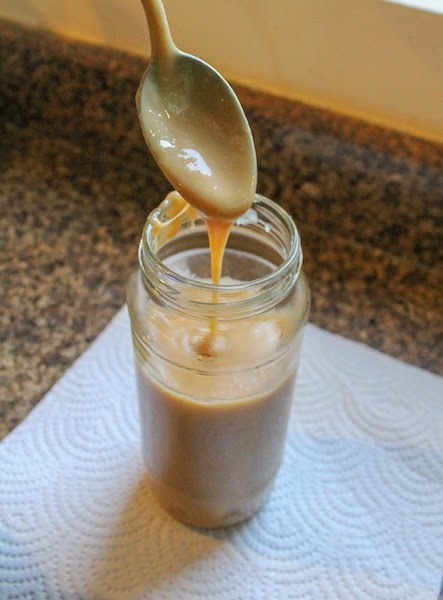 Put a metal teaspoon in a clean jar and pour the caramel in. Remove the spoon and seal tightly. 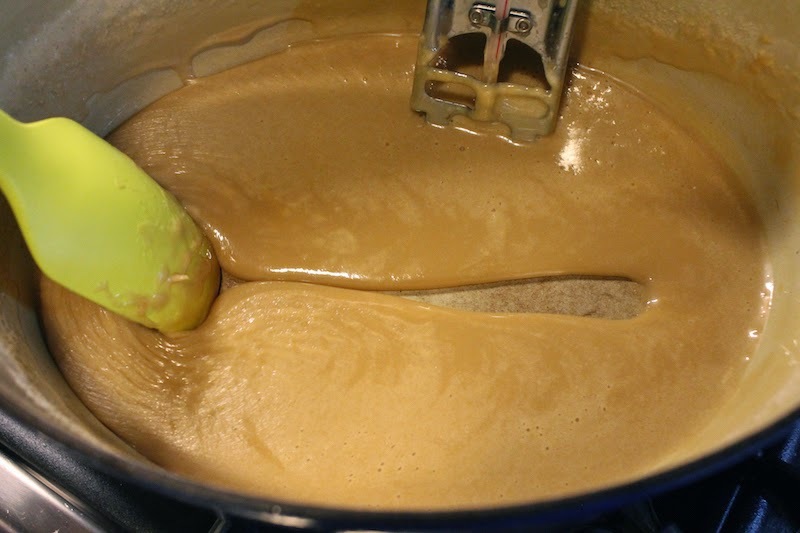 The caramel will thicken considerably when refrigerated and will keep for several months. This is great over ice cream or spread on bread or simply eaten with a spoon. Tomorrow I'll be sharing an Egyptian cookie recipe using it as well. 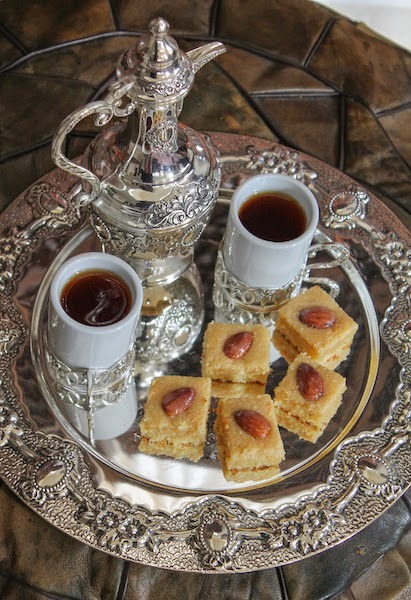 Update: Here are the basbousa using the camel milk caramel!